Guide-it™ sgRNA In vitro Transcription Kit (Code 632635)는 in vitro transcription 반응으로 간편하게 12ug 이상의 고품질, 고수율의 sgRNA를 제작할 수 있다. 본 제품 내에는 Phenol/Chloroform 방식이 아닌 스핀 컬럼 방식의 RNA 정제 키트인 Guide-it™ IVT RNA Clean-Up Kit (Code 632638)가 포함되어있다. 정제한 sgRNA는 그대로 transfection, electroporation 또는 in vitro cleavage assay에 적용할 수 있다. Guide-it™ Complete sgRNA Screening System (Code 632636)은 Guide-it™ sgRNA In Vitro Transcription Kit (Code 632635)와 Guide-it™ sgRNA Screening Kit (Code 632639) 제품으로 구성되어있다. 본 제품을 사용하여 in vitro transcription으로 합성한 sgRNA와 제품 내 포함된 Cas9 재조합 단백질을 실험 튜브 내에서 반응시킴으로써, 실제 세포 실험 전에 in vitro cleave assay를 통하여 sgRNA의 유효성 및 절단 효율을 확인 가능하다. 본 제품 이용 시, sgRNA의 절단부위를 포함한 DNA는 PCR 증폭 후, 재조합 Cas9 nuclease로 절단을 하며, 이 절단 효율은 agarose gel eletrophoresis로 확인할 수 있다. 본 제품은 기존 제품과 제품명은 같지만, 버전 업그레이드 출시되었으며 아래와 같이 변경되었다. 그림 1. 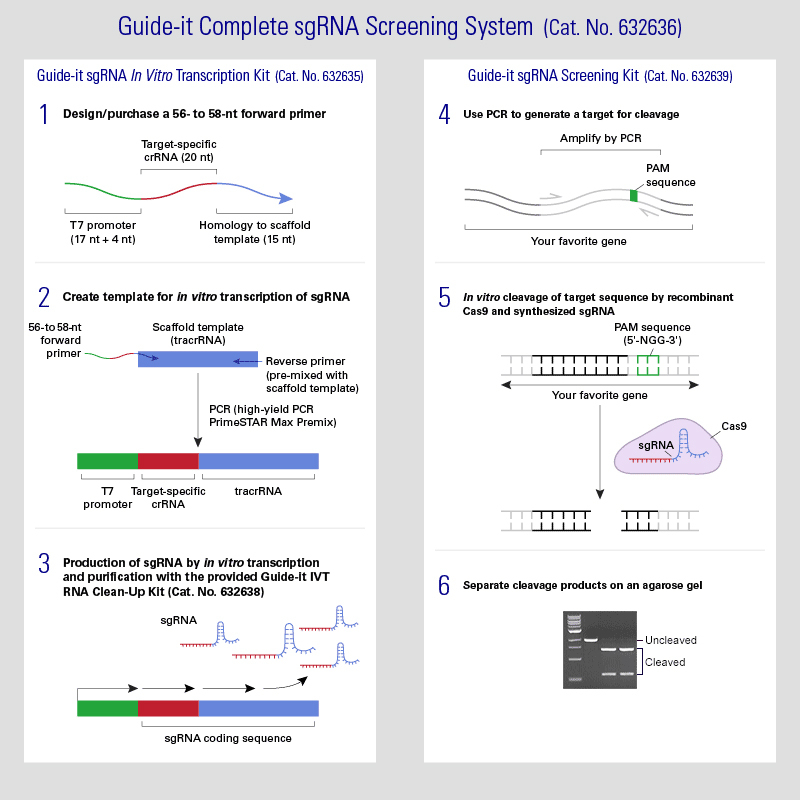 Flow chart describing how the Guide-it sgRNA In Vitro Transcription Kit (including the Guide-it IVT RNA Clean-Up Kit) and Guide-it sgRNA Screening Kit work together in the Guide-it Complete sgRNA Screening System, which can be used to synthesize and test the efficacy of sgRNAs. 그림 2. Schematic highlighting the key steps for using Guide-it kits for the production of high amounts of single guide RNA (sgRNA) and screening for cleavage efficacy at the desired target site using recombinant Cas9 protein. 그림 3. RNA quality produced via in vitro transcription. 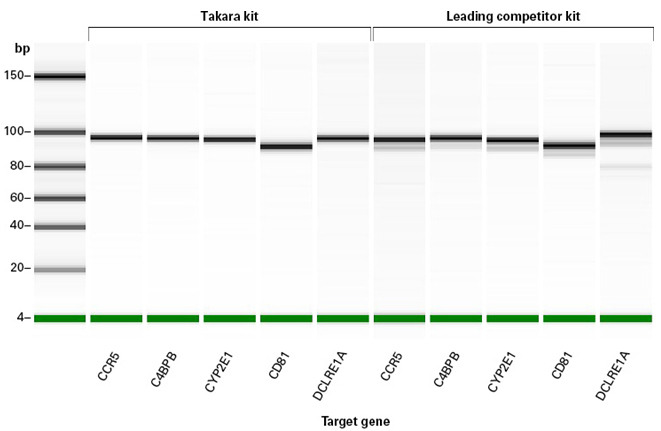 sgRNAs produced using the Guide-it sgRNA In Vitro Transcription Kit were compared with sgRNAs produced using a competitor’s kit. The Guide-it kit produced a high-quality, single band for each reaction, while the competitor’s kit showed unwanted byproducts. 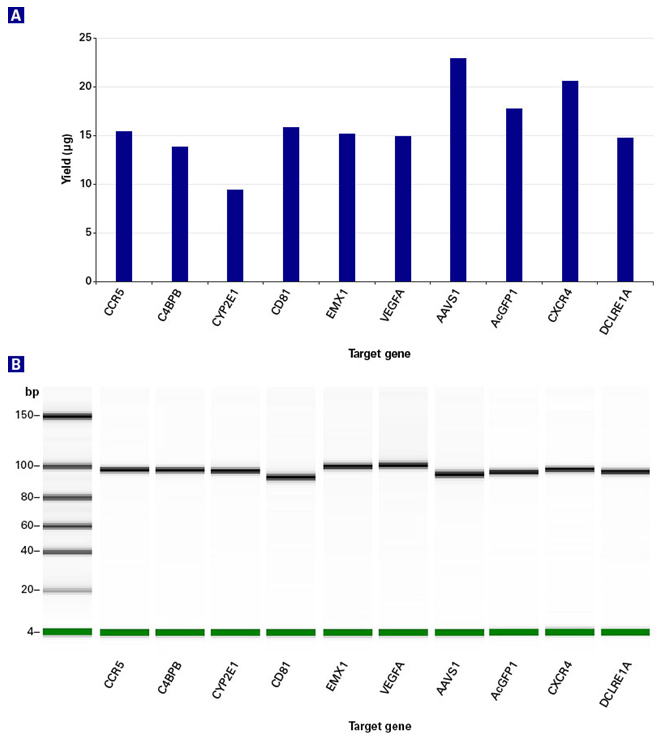 그림 4. sgRNA yield and quality for different gene targets using the Guide-it Complete sgRNA Screening System. Panel A. 20 μl of each sgRNA in vitro transcription (IVT) reaction was incubated for 4 hr at 37°C. The yield for each transcribed sgRNA was quantified using a NanoDrop spectrophotometer. Panel B. Each sgRNA IVT reaction was a run on an Agilent Bioanalyzer to assay for sample quality. Guide-it™ Complete sgRNA Screening System (Code 632636) 제품은 Guide-it™ sgRNA In Vitro Transcription Kit (Code 632635)와 Guide-it™ sgRNA Screening Kit (Code 632639)를 포함하고 있습니다.